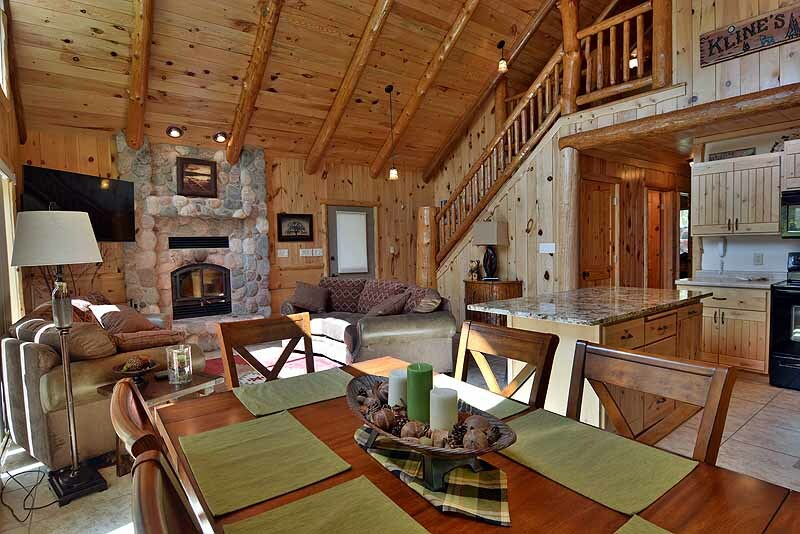 River’s Edge vacation home rental is a beautiful 2 bedroom with loft Northwood’s log-accented home located at the headwaters of the Namekagon River with access to Lake Namakagon. 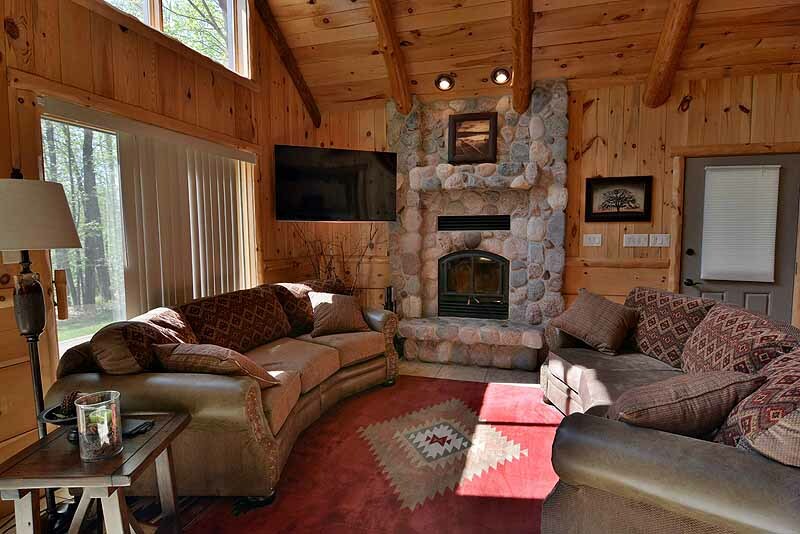 The rental is unique, featuring extensive interior and exterior log accents with wood burning fireplace in the great room. 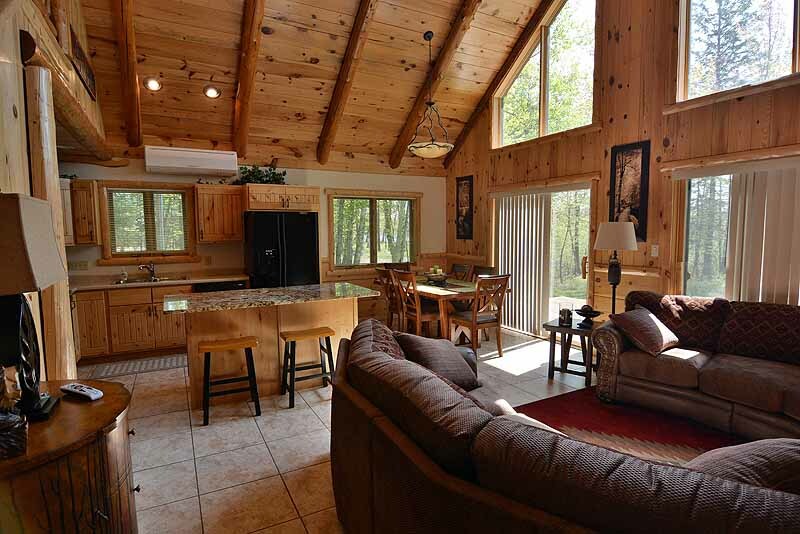 The location is private and wooded with nearly 200 feet of river frontage. 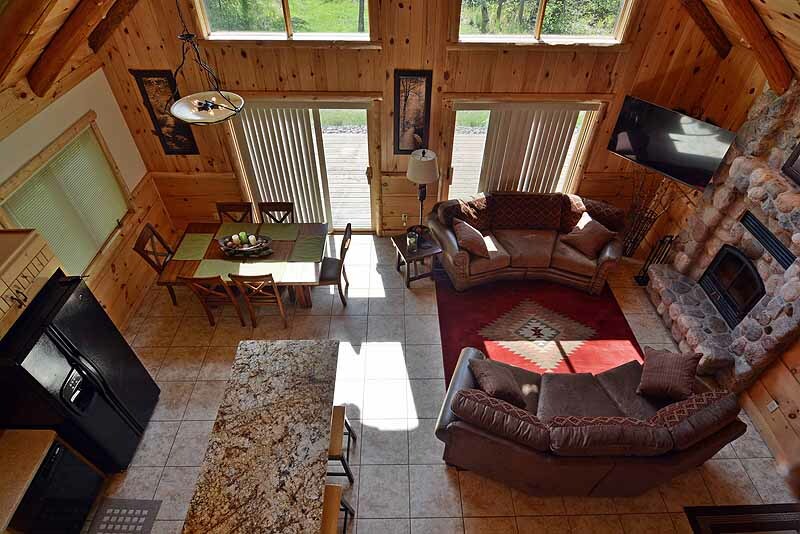 With its custom log accents, log furniture, décor and Northwood’s view, River’s Edge offers very comfortable accommodations with modern amenities like washer/dryer, cable TV and Wi-Fi Internet in Northern Wisconsin! Stay with us in the spring (20%) and fall (15%) and SAVE off our peak season rates! 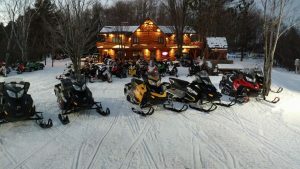 Our rates vary by season. The rates above are our peak rates and do not include taxes. For our rates at different times of the year, please visit our availability calendar. 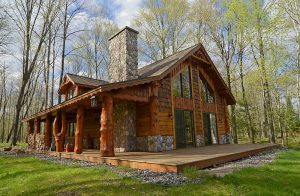 Air conditioning wall unit, washer/dryer, level ground accessibility, custom wood interior, unique log exterior, woodburning fireplace, large deck covered porch, dishwasher, cable TV and wireless Internet. 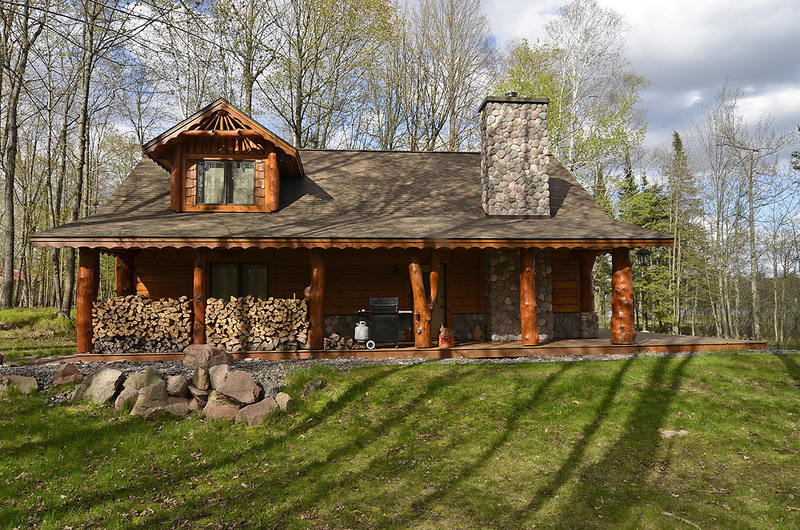 This recently constructed custom vacation home has unique log and cedar exterior and stone veneer and is located at the junction of the Namakagon River and Lake…only a short walking distance from the main lodge. 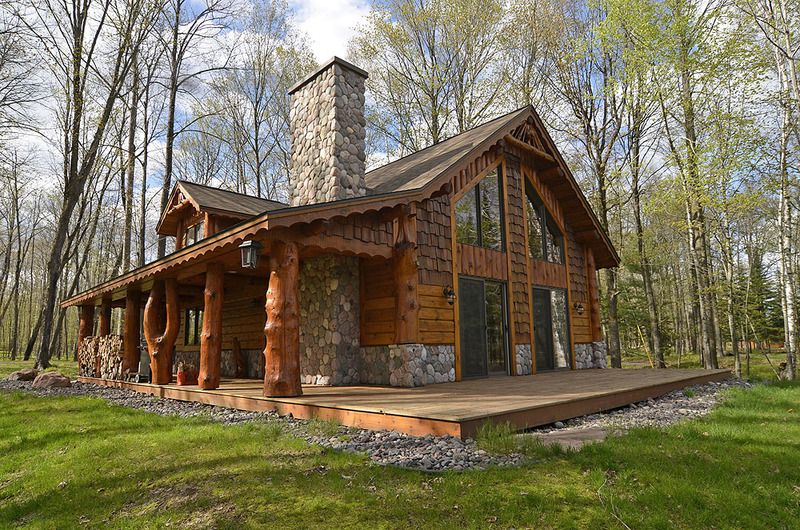 The large, wrap around deck includes a covered porch supported by immense log posts and an open section of deck overlooking the picturesque water front. There is a private pier allowing access to both the river and the lake! Sliding doors off the deck lead inside to an immaculate great room with cathedral ceiling. 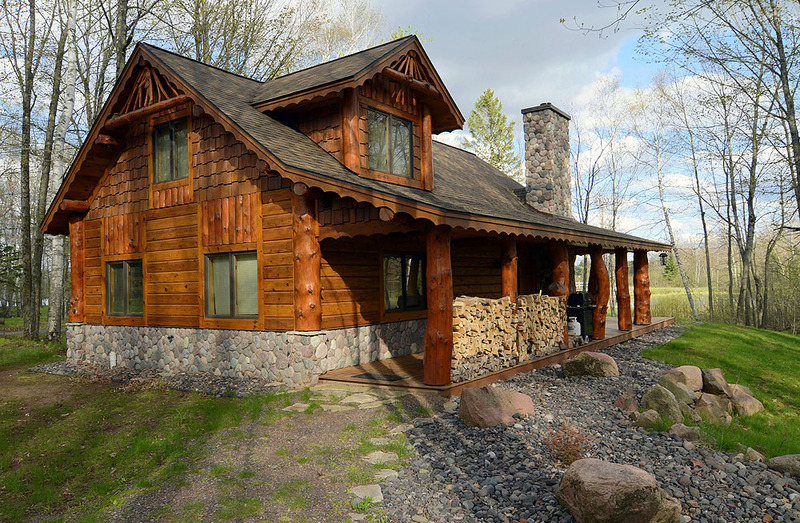 The home features several different types of wood finishes, log accents and a stone, wood burning fireplace and ceiling fans throughout. The comfortably furnished, tiled great room has living room sofa and armchair set in front of the fireplace and flat panel TV, cable TV and Wi-Fi Internet. The clean, modern kitchen features beautiful wood cabinetry, tiled floor, and kitchen island with stools. 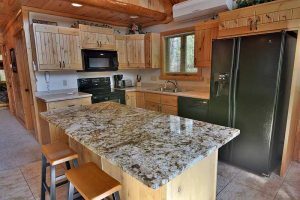 The kitchen has an electric stove, oven, dishwasher, coffeemaker, toaster, microwave and full size refrigerator/freezer. The open floor plan allows easy movement from the kitchen to the dining room table with its views out to the waterfront and front deck. There is an air conditioner wall unit and washer/dryer, too. 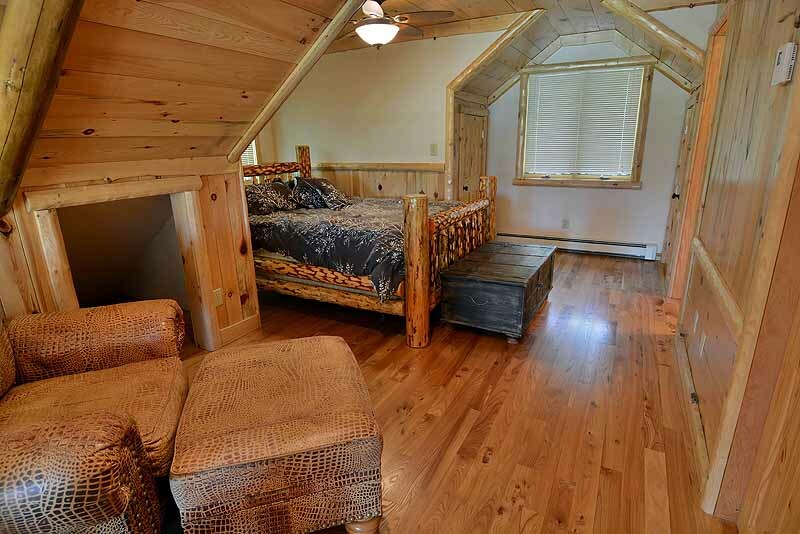 River’s Edge vacation home features 2 separate carpeted bedrooms furnished with log beds, and an additional loft sleeping area. There are 2 bedrooms and 1 full bath on the first floor of the house. 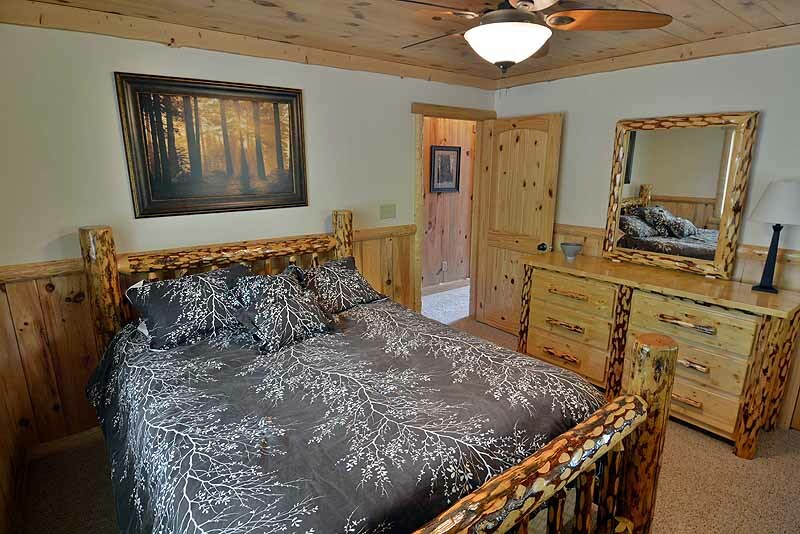 The first bedroom has 1 queen bed, closet and ceiling fan. 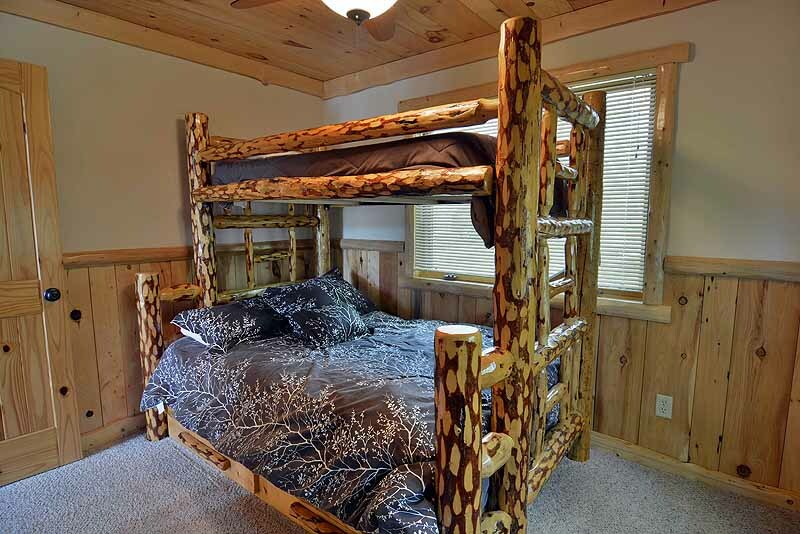 The second bedroom has 1 set of bunk beds (double on bottom with twin on top), closet and ceiling fan. 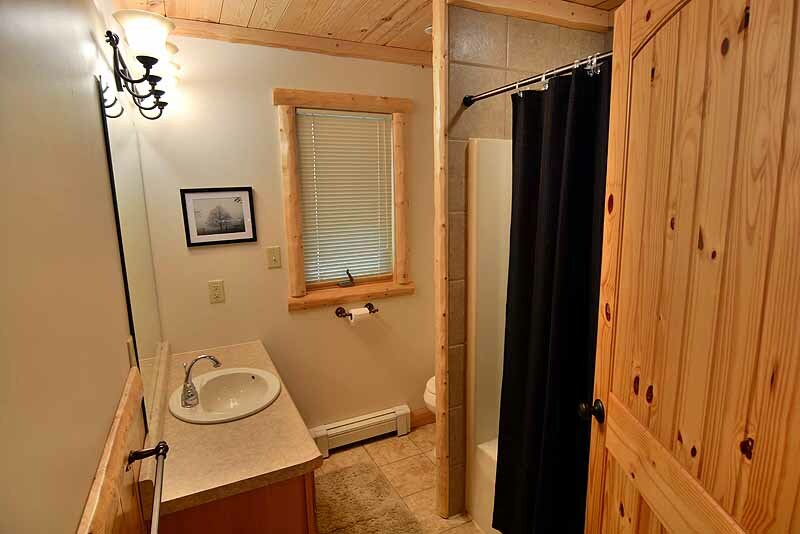 The full bath has a tub/shower. 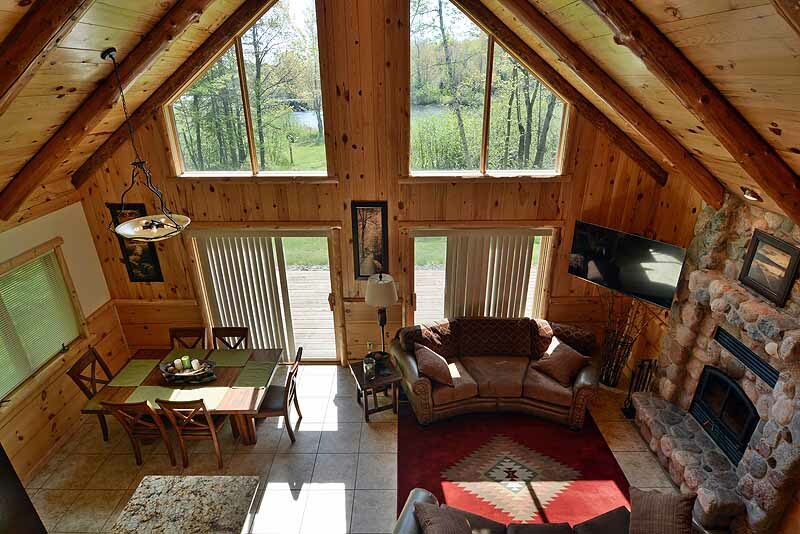 Enjoy the view of the great room and views of the lake and river from the loft. 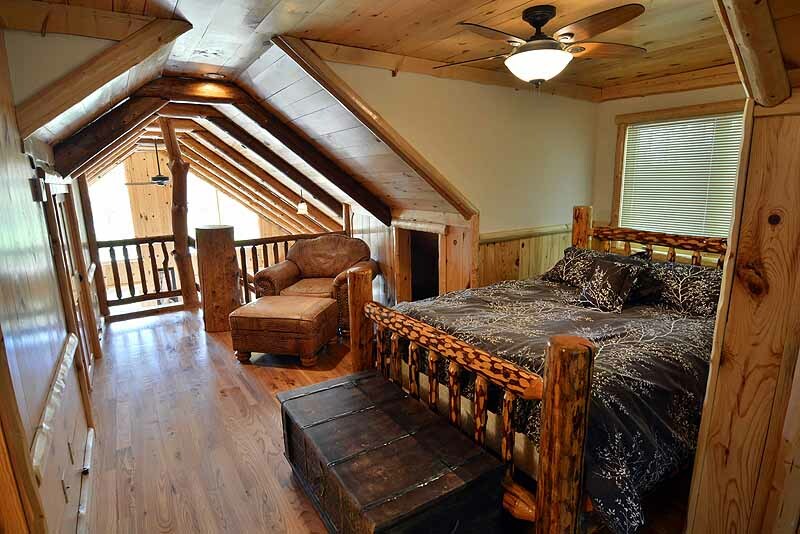 A custom log railing constructed of large log posts leads you up the stairs to the second floor where you will find a loft sleeping area and second bath. The loft has 1 queen bed and 1 over chair with ottoman. There is a full bath with shower. 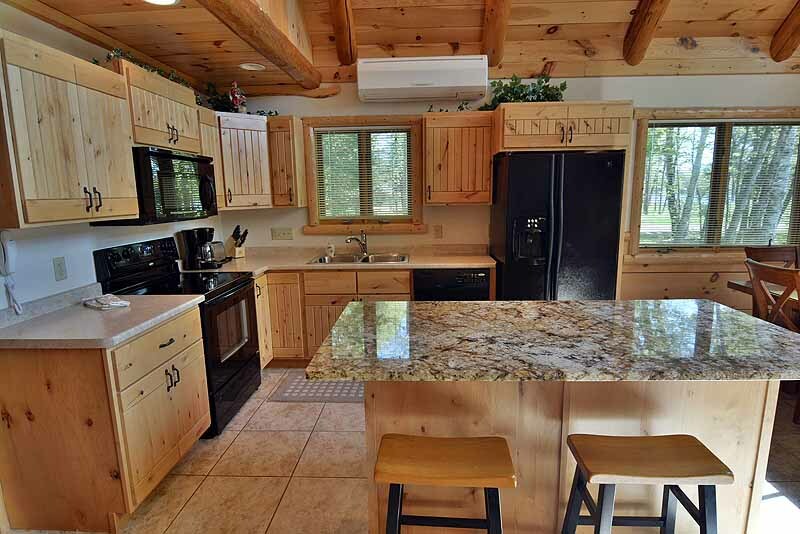 River’s Edge is a wonderful Northwood’s vacation home offering clean, modern, comfortable accommodations in a 1400 sq foot, 1.5 story home away from home! • Currently there is coverage with T-Mobile. Otherwise cell phone coverage is best described as ‘spotty’ with Verizon Wireless and other providers. Four Seasons offers Verizon network extenders for a rental fee of $50 for the length of your stay. The Network Extender is compatible with ALL Verizon Wireless phones as well as some handsets from many of the nation’s leading carriers. Limited number of extenders available.